Google and IBM are to make a new effort in "cloud computing"
Google is to team up with IBM in an effort to boost access to large-scale computing via the internet. Google reckons that current access to large computing structures for academics is problematic. Even large centralised servers are "struggling to cope with today's modern computational challenges, which now involve terabytes of data and processing requirements well beyond a single CPU (or two, or four, or eight)," says Christophe Bisciglia, senior software engineer at Google. 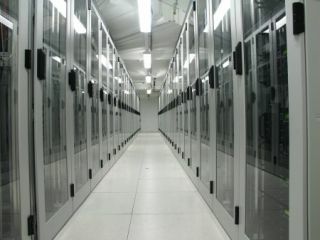 So Google is to make a new effort in "cloud computing" - with the help of IBM it will form large data centres that academics will be able to tap into over the internet. Google already has experience in these circles, as do many of the other internet giants. But there are cost implications here, too: could such developments reduce the need for so many data centres in the future? Google has announced a programme to "extend our expertise in large scale systems to strong undergraduate programs at [several] pilot schools". "As the pilot progresses, we'll work with our technology partner IBM to shake the bugs out of the system so that we can expand the program to include more educators and academic researchers," explains Bisciglia. Google has set up a site explaining the technology.